September 11, 2001: north face of south tower of the World Trade Center in New York City. 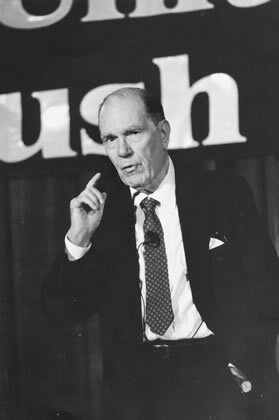 April 25—Lyndon LaRouche’s fight against British-run terrorism began during his U.S. military service in India in August, 1946. He recounted it in the course of a briefing to associates on April 24, 2010. And that was sort of the beginning of my political career, because the events that I experienced later—this was at the time of Roosevelt’s death—but later, coming back from northern Burma, back into Kanchrapara, and then into Calcutta, this became a bigger question. You know, I did the obvious thing that anyone would do in intelligence. (I wasn’t in intelligence, except myself.) So, I just got into Calcutta, and went to the relevant telephone directory, and pulled up the list of all the political parties, their addresses and names, and telephone numbers, I called them up, and said I wanted—as an American soldier, I was interested in the future of India, and that I would like to talk to them, basically about the future India from an American standpoint. So, I talked to all these people. They greeted me, they entertained me nicely, and I was having a grand time in Calcutta at that time, as a soldier—just the grandest time, meeting all these people, getting mixed up in all this culture and this sort of thing. So then, the British did what the British do. There was a routine demonstration coming down the street, which was then called Dharmatala, which led to the Governor General’s palace across the other side of Chowringhee. And, I met some students. There was a great trolley car station right at that intersection, they were there, and I said, “What’re you up to?” And they said, “We’re going on to make this demonstration at the Governor General’s palace for Indian independence.” I said, “Fine.” And shortly after that, after they’d gone there, they were attacked by a lathi charge—you know, brass tips on a bamboo stick, which is rather nasty, because it has a whip-like effect. And they killed a few people. It had not happened recently, at that point, so obviously, this was a British provocation. And it resulted in a large demonstration, two days later, coming down Dharmatala. Now, for the large demonstration coming down Dharmatala, which is on the other side of Chowringhee, away from the Governor’s palace, the British had stationed two heavy machine guns, aimed down the street of Dharmatala. And as the crowd moved up, abreast from sidewalk to sidewalk, from building to building—massive—angry people. Hindus, Muslims, no difference. And the British opened direct fire with heavy machine guns, directly into the crowd, and kept the fire going. The war was over. The Roosevelt policy was what it was, for India, even though Roosevelt was no longer there, and the intention was the development of industry. Because you had poor people, working for a few annas a day, as pay, as labor—not enough, really, to live on—working as coolies for the British Army. This kind of situation begged the creation of sovereign government, according to the Roosevelt policy. But, Truman was not Roosevelt, but quite the contrary. And so, that was my experience. My association with these kinds of processes was defined by these events abroad, during my military service, at the end of World War II, both in Burma and India—two times in India, and once in Burma. And I came back to the United States, and it had changed, from what I had seen when I had lived there before, before going abroad. 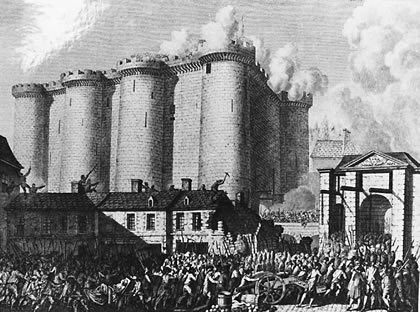 To understand the very high level of control over, and backing of, these terrorist actions (above), we must think back to the Jacobin Terror first launched from Jeremy Bentham’s London on July 14, 1789 (storming of the Bastille in Paris, below). Ashcroft was an insult to the Congress. If the Democrats in the Congress capitulate to the Ashcroft nomination, the Congress is finished. This is pretty much like the same thing that Germany did, in February 28, 1933, when the famous Notverordnung (emergency decree) was established. Just remember after the Reichstag burning, the Reichstag fire, that Goering, who commanded, at that time, Prussia—he was the Minister-President of Prussia at the time—set into motion an operation. As part of this, operating under rules of Carl Schmitt, a famous pro-Nazi jurist of Germany, they passed this act called the Notverordnung, the Emergency Act, which gave the state the power, according to Schmitt’s doctrine, to designate which part of his own population were enemies, and to imprison them, freely, and to eliminate them. This was the dictatorship. Now, remember, that Hitler had come into power on January 30 of that same year—less than two months earlier. He’d come in as a minority party, which had been discredited in the previous election. He was put in by bankers, including the father of President George Bush, the former President, Prescott Bush. Prescott Bush, as agent for Harriman of New York, worked with the British banks, to put Adolf Hitler into power in January of 1933. At that time, Hitler was discredited and about to be bombed out. He was stuck into power because that was the last chance to get him in power. Everyone said, “No, Hitler’s not going to make it, because the majority of the population is against him.” Then, on Feb. 28, 1933, the Notverordnung act was passed, on the pretext of the Reichstag’s fire. And this established a dictatorship, which Germany did not get rid of until 1945. Now, I’m not suggesting that the case of Ashcroft is comparable to the Reichstag fire. But it’s a provocation, a deliberate provocation. . . .
You don’t know—We’re going into a period in which either we do the kinds of things I indicated in summary to you today, or else, what you’re going to have, is not a government. You’re going to have something like a Nazi regime. Maybe not initially at the surface. What you’re going to have is a government which cannot pass legislation, meaningful legislation. How does a government which cannot pass meaningful legislation, under conditions of crisis, govern? They govern, in every case in known history, by what’s known as crisis management. In other words, just like the Reichstag fire in Germany, How did that happen? Well, there was a Dutchman, who was a known lunatic, and was used to set fires, as a provocateur. And he went around Germany setting fires. And one night, with no security available for the Reichstag, he went into the Reichstag building, and set the joint on fire. And Hitler came out and said, “Well, let’s hope the Communists did it.” And Goering moved, and the Schmitt apparatus, that is, of Carl Schmitt, the jurist. And they passed the Notverordnung. And on the basis of a provocation—that is, crisis management—they rammed through the Notverordnung, which established Hitler as dictator of Germany. 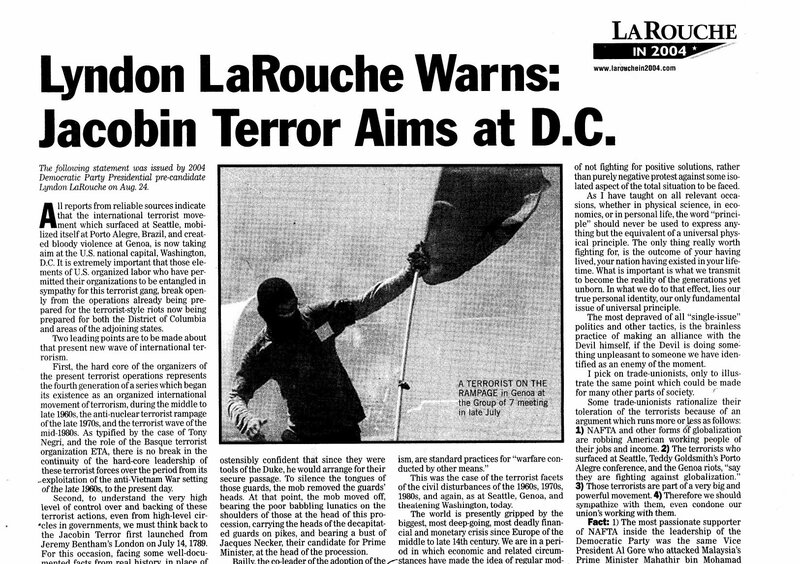 On Sept. 11, 2001, the LaRouche movement was distributing this statement issued by Lyndon LaRouche on Aug. 24, anticipating British-sponsored terrorism in Washington in the immediate days ahead. 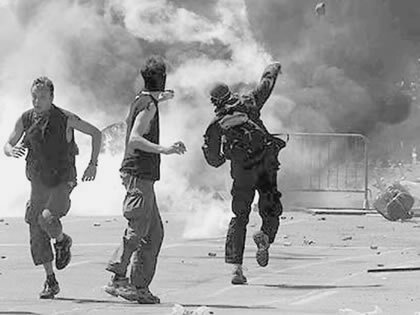 All reports from reliable sources indicate that the international terrorist movement which surfaced at Seattle, mobilized itself at Porto Alegre, Brazil, and created bloody violence at Genoa, is now taking aim at the U.S. nation’s capital, Washington, D.C. . . ..
To understand the very high level of control over and backing of these terrorist actions, even from high-level circles in governments, we must think back to the Jacobin Terror first launched from Jeremy Bentham’s London on July 14, 1789. For this occasion, facing some well-documented facts from real history, in place of the usual university textbook fairy tales, will be most helpful in assisting relevant authorities to defend the security of Washington, D.C., and its environs. After documenting the British empire’s organizing of the Jacobin Terror against a threatened alliance of a republican France with the United States, the statement drew back to situate the threat of that present moment, within the world crisis. The world is presently gripped by the biggest, most deep-going, most deadly financial and monetary crisis since Europe of the middle to late Fourteenth Century. We are in a period in which economic and related circumstances have made the idea of regular modern warfare a sick joke, in which regional and other “little wars,” terrorism, political assassinations, and other forms of destabilization, are leading items on the agendas of many of the strategic planners. The financial and monetary crisis in its presently advanced stage, drives desperate political forces to the brink, desperate political forces who would rather drive civilization itself to the brink, than tolerate the changes in financial and monetary institutions which the present crisis-situation demands. LaRouche was being interviewed live by radio host Jack Stockwell from Salt Lake City Utah, from 7:15 to 9:00 AM Mountain Time, as the 9/11 attacks unfolded. 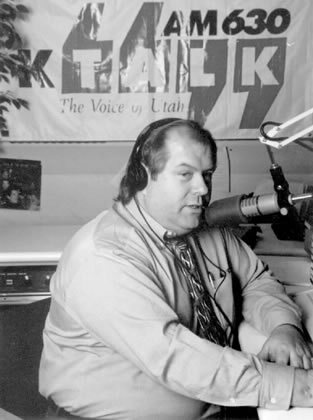 Lyndon H. LaRouche, Jr. (right) and Utah radio talk show host Jack Stockwell. 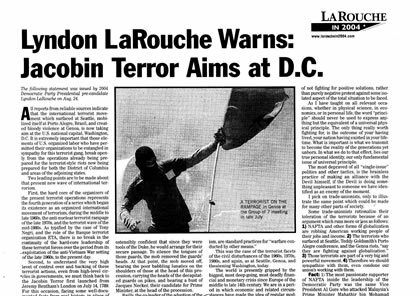 As reports came in, LaRouche and Stockwell put the picture together of the attack on the United States. Witnesses are saying that they are seeing people jumping out of the World Trade Center. LaRouche: That’s a phenomenon, that is a phenomenon, that happens. LaRouche: But the point is, you think about—you start with the beginning. You say, a plane comes out of Logan Airport in Boston, American Airlines. And the report, which may not be accurate, of course, is that it was hijacked after takeoff—which would make sense; I mean, that’s the way something like that would tend to happen. But there are people on that plane—you know what the size of that plane is. Stockwell: Yes, a 767 is going to hold at least 250 people. LaRouche: Okay, fine. So, they’re going to crash into the South Tower of the World Trade Center in New York City, lower Manhattan? Already, you’ve got a death toll right there. A real massive one. Now, you have the building collapse, right after the beginning of the business day, and presumably most of the employees, and a lot of other people, are going in there—you’ve got— you’re talking about a mega-catastrophe in terms of human toll building up around this thing. And you begin to get a pattern too. Because these things that happened, since they appear to be intentional, and the coordination suggests intention, this means it’s a planned operation—it is an attack on the United States, from whom we don’t know. I’ve got my own ideas about how this thing worked.